State police say the Tao’s Travel Inc. bus with 57 people aboard overturned on an Interstate 95 exit Tuesday in Prince George County. Police say the surviving passengers’ injuries range from minor to serious. The driver was not injured. Monique Berry, of Harlem, New York, told news outlets the bus was moving “too fast” Tuesday morning and when she came to, a man next to her grabbed her and they crawled out a window. Virginia State Police say two people aboard the Tao’s Travel Inc. bus were killed and numerous other passengers were injured when it overturned on an Interstate 95 exit Tuesday in Prince George County. Police say that as the bus with 57 people aboard turned onto the exit, it ran off the left side and overturned. Police say numerous passengers are being treated at area hospitals with injuries ranging from minor to serious. They say charges are pending against the driver, who wasn’t injured. 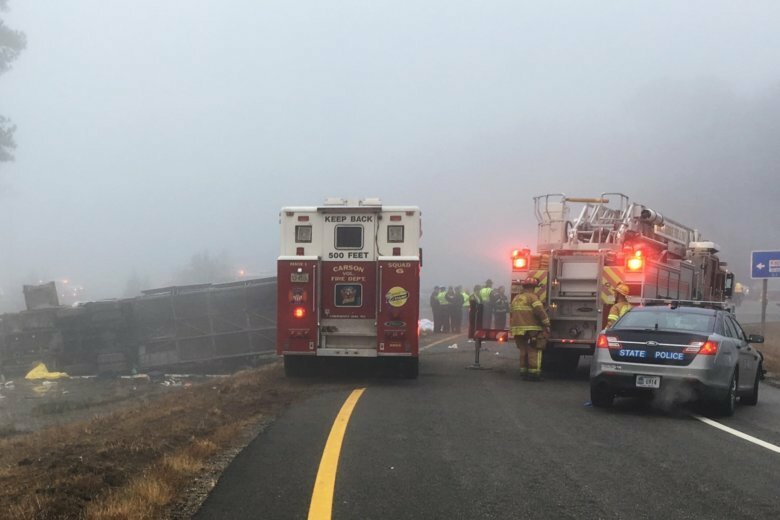 Virginia State Police say in a statement that the Tao’s Travel Inc. bus with 57 people aboard overturned on an Interstate 95 exit Tuesday in Prince George County. Police say that as the bus turned onto the exit, it ran off the left side and overturned. Police say two people died and numerous other passengers are being treated at area hospitals with injuries ranging from minor to serious. They say the driver, a 40-year-old man from Staten Island, New York, wasn’t injured.